I decided to try acv to my diet after reading good things about it. Since I Hate the taste I didn't want to prolong it so went for a straight Tb followed but a large glass of water. Immediately got the sweats and dizzy and sick to my stomach. Ok, not one to take no for an answer the next day I put a tsp in 20 oz of water...no effect but still couldn't tolerate the taste so today I put 1 Tb in about 4 oz of water and gulped followed by some herbal tea. Took a few minutes but still got that sick feeling and shaky. Had to lay down for about an hour. Anyone else have trouble tolerating it? How do you take it? I use a tablespoon on my salad with lunch and dinner, along with olive oil as part of my dressing. I've never had a bad reaction to it. Do you have a problem with other vinegars? 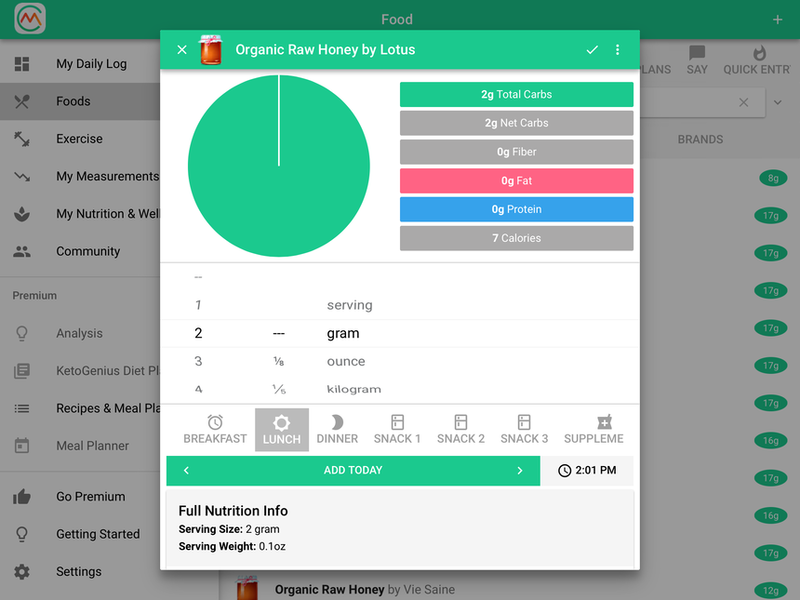 Just a heads up--2 teaspoons of honey would be more than half my daily carb allowance, the app says 12 carbs. I look for more bulk and nutrition in my carbs. goplay not only that it converts to sugar so it's not allowed in any amount. goplay no I don't but I really hate the taste. Ok, so it's not a food intolerance, that's good--you reaction description made me wonder. Have you tried it in foods instead of just in water? I chop up 2 tomato slices, 2 cuke slices and 1/4 avocado and shake them together with apple cider vinegar and olive oil and use it as salad dressing. I barely notice it as an outstanding flavor--but I know that can be different when you truly dislike a flavor. goplay that sounds good, I'll try it tomorrow. Thanks for the suggestion. You're welcome--hope it goes down better for you! linrenep I googled your reaction. You mentioned your on a few different meds, I found this. I have a feeling this applies to your reaction and probably should avoid it or in super diluted doses or possibly not take it at all. goplay are you allowed to add stevia to your dressing? I find that helps eliminate the sharpness of the vinegar. I use acv, yellow mustard, salt, pepper and stevia sometimes I'll add oregano or garlic salt. Great dressing. Badmojomn we are thinking alike. I too read this and did check with my doc first...but am going to check again before a delete performance. If I leave out the greens and just eat a bowl of the 'dressing' (veggies and oil/vinegar), sometimes it is as good as ice cream to me. laser_brit60c4 yes, you can add Stevia. goplay sorry that was a typo. It was supposed to be 2 grams not teaspoons. I use raw organic honey by Lotus and 2 grams is just 2 carbs. With the meds I take I can not use artificial sweeteners of any kind so this was the recommendation by my Dr. It does not sweeten the taste it just provides a measure of coating to the stomach lining so the overkill of acid mixing with the vinegar doesn’t cause a bleeding issue over time. linrenep honey Is a natural substance and not a refined sugar. most all foods have some measure of natural sugar in them. And there are only 2 carbs in 2 grams. fastblnd8228 understood. But honey also is known to spike insulin and thus hunger more than other sweeteners and is usually not recommended on keto. If its working for you I say go for it. That's something I hope more people ( not you, talking to the masses here) need to understand about keto. Its not a fad diet, not lose quick then get off. Its a total change in how your body metabolized food. No two people are alike so there is no hard and fast rules apply. Listen to your body. Eat what is right for you. All this other stuff is guidelines, not hard fast rules. fastblnd8228 heard good things about turmeric. Ok I have been taking ACV for years, and I add Stevia to two tablespoons of acv and 8 oz of water. You can decrease it to a teaspoon to 8 oz water. Stevia helped me to drink the mixture and I drink it twice a day. Hope this works for you. I take two ACV 600 mg tablets per day. Hold my nose as i drink it down with water -the jury is still out if there is an effectiveness taking liquid v pill. I think it helps for me. Down 30 pounds in less than 4 months. fastblnd8228 I measured that out, it’s possibly less than a half a teaspoon. I think that would be okay on ketogenic.